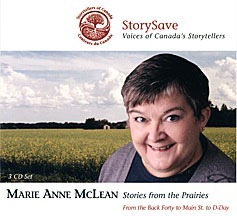 Storytellers of Canada – Conteurs du Canada (SC-CC) are proud to present the stories of Edmonton based Marie Anne McLean who is thereby recognized a true national storytelling treasure. This three-CD audio recording was officially released at the 2009 Annual Conference of the SC-CC held in Victoria, B.C. July 8 to 12, 2009.